This work day was made possible by John Habina and his girlfriend Charlotte. John is the manager of Vintage Manufacturing and volunteered to open the shop building when Steve Freeman was unable to attend due to prior commitments. John and Charlotte set new standards for hospitality by having coffee brewed and doughnuts available for the volunteers when we arrived! So our "Thanks!" to John and Charlotte for hosting us and allowing us to continue working on the projects! 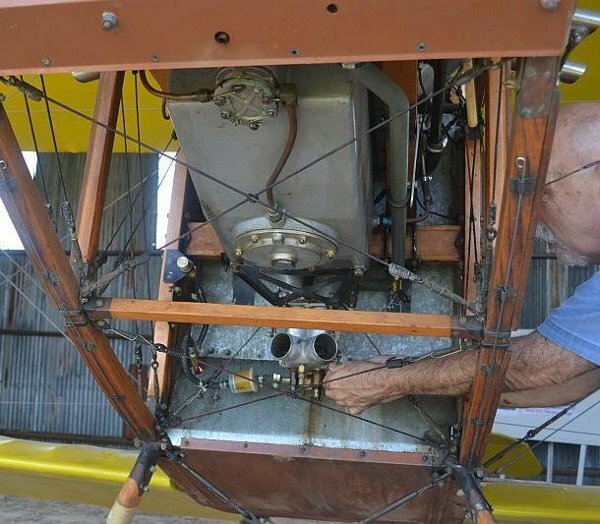 Dave Edgerly started the process of disconnecting the OX-5 engine from the airframe so the cylinder heads can be refurbished. Dave was very methodically removing components - taking pre-disassembly photographs, bagging & labeling parts and carefully stowing parts so they don't start drifting off. Dave feels the best option will be to remove the radiator and pull the engine from the airframe so the cylinder banks can be easily worked on. Dave removed ancillary items like the carb to prevent damage while the engine is out of the airplane and spent a lot of time tracing oil and water lines and disconnecting them. Many of these lines were zip tied to parts of the structure or snaked their way around engine bearers which necessitated their removal so the engine can be yanked. Ian Whitaker and Al Sumrall took a look at "Old Pete" and tackled the airspeed indicator issue and they think they fixed it! Ian disconnected the airspeed indicator to test it, attempting to figure out whether there was a clog in the pitot or the line running through the wing, or whether the problem is the ASI meter in the cockpit. They separated the exposed copper tubing from the reinforced plastic tubing at the joint where the copper tubing penetrates the cowling. With the airspeed indicator disconnected, they then gently blew into the tubing and were surprised to hear a gurgling/ tapping and rattling sound in the wing root. Removing the wing root fairing covering the joint between the wing and the center section took but a few minutes and sure enough the plastic tube connecting to the external copper section was not connected inside the wing root. Al reports there is a bit of an angle there, the plastic tube is positioned well forward of the copper tube running up the cabane and when trying to attach it the plastic tube pulls against the copper tube and it appears that either the plastic tube slipped off the copper tube or was never connected when the wing was reattached. There was no sign of the tube clamp that should have been there! Next workday Al and Ian will reattach the copper and plastic tubes and will put a pipe clamp on it to ensure that there is no more stress that might cause it to slip off again. They did check to make certain the tube in the wing was clear and open. At this point they are assuming there is nothing wrong with the ASI instrument in the cockpit, but if reconnecting the lines does not resolve the issue the instrument will need to be removed and tested. Also Ian found a prop (76x42 with red tips) in the back room that had impressions on the back of the hub that are identical to old Pete's prop hub flange. The prop should be right for Old Pete if it is good - it has some epoxy wear on the leading edge and the tips appear banged up a bit but the varnish is otherwise excellent. The prop could probably use some reconditioning on the leading edges. Steve Freeman will be consulted at the next workday for an evaluation of the prop and a plan of action generated, if needed. Ron Marcotte, Jerry Stark, Steve Richardson, and Bob Herbage went to work on the metal cowlings for T-2. 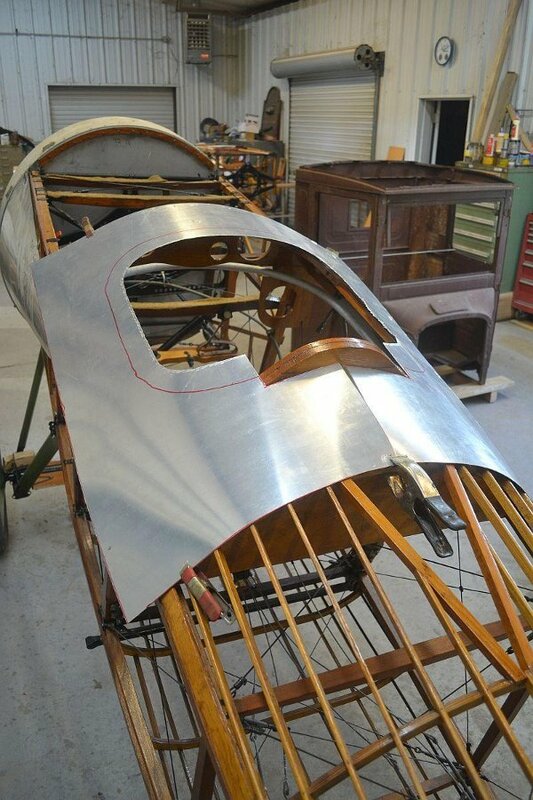 Both cheek cowlings were cut and shaped and the cockpit coaming panel was started. The process was the usual drill, starting with T-1 panels as templates where possible, and cardboard patterns where using T-1 pieces wasn't feasible. Ron and Jerry worked on using T-1 cheek cowling panels as templates for T-2 parts, while Bob and Steve mocked up the cockpit coaming panel starting with a cardboard template and ending with snipping aluminum (Kevin Monahan assisted with the snipping part)! At the end of the day both cheek cowling pieces were essentially shaped and trimmed, and the cockpit coaming was roughed out as the trimming continued. Lynn Howell and Al Sumrall were working on the wrecker trying to figure out why there is no electrical current to the starter and engine. They replaced the coil but there was no change in how the electrical system has been operating, so the diagnostic work will resume next workday. At this point they do not know whether the fault is minor or major. Not much was done on the Blue Racer, but the vehicle was sporting a new cylinder head and Lynn took the seat home with him to reinforce it, as it is currently considered too weak (another instance of modern "plus-sized" people not fitting the old machinery?). Al Sumrall states that all the parts necessary to finish the planned upgrades to the Blue Racer are on hand and he expects the vehicle to quickly come together over the next workday or so. Cameron Whitaker fabricated a new ignition advance linkage part at home and brought it to the workday. Al commented that the Blue Racer's ignition linkage was so wobbly that moving the lever in the cab made little difference at the advance mechanism! 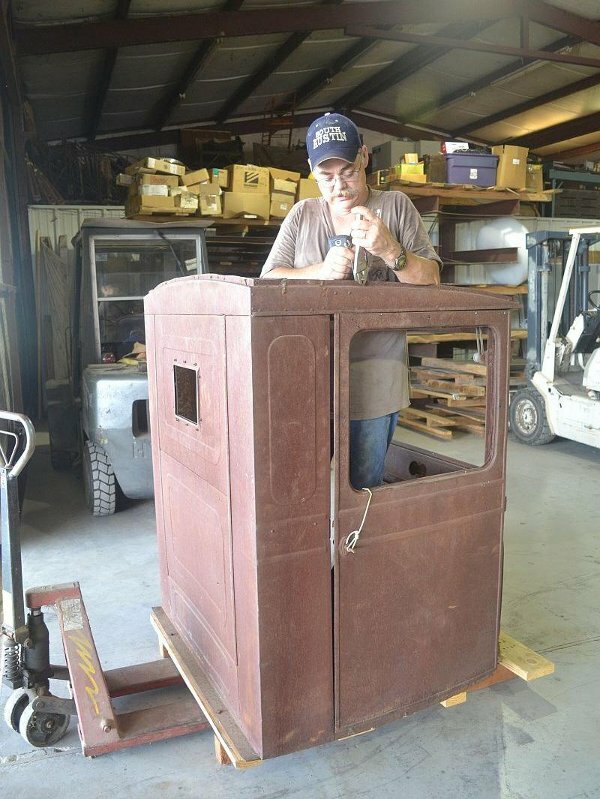 Terry Bledsoe, with help from a few other volunteers, moved the TT cab from the hangar and on to a pallet in the shop area to make working on it easier (the cab was stored up on the TT's bed!). Terry then started some minor disassembly on the *new* TT Cab to begin work on straightening flanges and smoothing dents and dings. Among his many talents Terry said he has prior professional body work experience! The Ts were driven to lunch again after batteries were charged up. Today's restaurant was about halfway to Seguin, so it was a longer trip than usual. On the trip back the Field Service Ambulance blew a tire - it appears that the tire failed and separated from the clincher rim, stranding the vehicle out on the road. Ian had no problem stopping it safely. Cameron motored on back to Kingsbury and borrowed one of Bruce's wheel & tire assemblies and got the ambulance back to the Aerodrome. Inspection revealed that the tire failure was not due to tire rot or excessively worn tread so the most likely cause is either a defective tire or damage incurred during mounting the tire on the rim. A new tire will be required and Cameron and Ian Whitaker took the rim to Texas Ts to get a new tire and have it mounted. Steven Penaluna brought log books for all the Model T vehicles (with one left over for the Triumph motorcycle). Each T got a log book started and the books are stored under each vehicle's seat in a waterproof baggie for protection. The logbooks will be used to document issues and repairs, and possibly running times. Also, two representatives from the Texas Transportation Museum dropped by for a visit and were pleasantly surprised at what they found. Al Sumrall thinks we'll be seeing more of them in the future. Kevin Monahan spent a little time working on the Triumph - the final issue he had planned to tackle was the registration plate on the front fender - the lettering didn't appear correct. Kevin spent some time rubbing off the current sticker lettering and discovered previous lettering underneath - though it was covered in black paint still. Kevin and Dave Miller spent some time on a laptop comparing fonts with the hidden lettering on the bike's registration plate. Kevin has decided which font to use so the final step will be reproducing it on the plate. Later, on July 31st, Kevin circulated a photo of the fender registration tag - he'd continued sanding down through the black paint to uncover the original lettering. Kevin reports that he picked up the Indian's fuel tanks today (July 25) - they needed some soldering done to seal leaks. Kevin's next step is to coat the tanks as an additional barrier to leaks and address some suspected corrosion in one of the tanks. Kevin reports he took great pains to document the Indian logo that was on the sides of the tanks so they can be reproduced when the fuel tanks are repainted. Kevin has also been chasing repair parts to address some of the bike's mechanical issues in addition to plugging oil leaks left, right and center! So far, the most challenging leak has been the oil pump leak. Kevin also disassembled the headlamp for repair and clean-up and has reassembled the unit with a new bulb in it. Kevin is waiting on gaskets and drive chain adjuster as well as the clutch release worm gear. Kevin reports that he has given up for now on locating transmission gears and the kick start gear but says that replacing those parts isn't absolutely necessary yet.